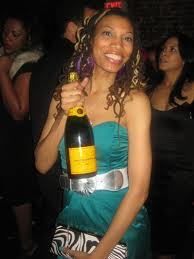 Chicago New Year's Eve 2011: Five of Chicago's Most Expensive Celebrations. Let the Dom Perignon flow, the Grey Goose fly and have an Effen good time ringing in 2011 at some of Chicago's priciest New Years Eve 2011 bashes. Here are five to get you rolling. Ante up and get ready to party. 1. HUB 51 New Year's Eve 2011 for the Young and Hip with Deep Pockets. This Black Tie party bills itself as the best in the city. The stylish River North restaurant, HUB 51 features soaring, exposed ceilings and an open floor plan. The downstairs club, SUB 51 is a unique and intimate space designed by DJs for DJs. For $3000.00 (plus 10.25 sales tax)...you can have the HUB 51 Platinum VIP Experience. "The experience" includes a semi-private seating area, tickets for up to 12 guests, 3 bottles of Grey Goose Vodka and a magnum of Veuve Cliquot Yellow Label Champagne. "Experience two" at HUB 51 comes with a price tag of $1300.00 (plus 10.25% tax). When ordering just ask for "The HUB 51 VIP 'H' package." The 'H' experience includes a private reserved table for six guests with two bottles of Grey Goose and one bottle of Perrier Jouet Champagne. For the bargain basement price of $135 per person, guests opting for the "General Admission package" will have access to the premium open bar from 9 PM until 1 AM. and passed hors d'oeurves. The bar offers top labels including Grey Goose, Bombay Sapphire, Jack Daniels, Patron, Effen Black Cherry, and Johnny Walker Black plus bottled imported and domestic beers, house wines, house champagne and martinis. The hors d'oeurves feature Crispy Short Rib Tacos, Shaki Shaki Ahi Tuna bites, King Crab California Rolls, Tenderloin Skewers, Butterscotch Pot Du Creme, Martha's Famous Carrot Cake and more. All packages include a champagne toast at midnight and entertainment. 51 W. Hubbard St. Reservations: 312 828 0051. Fri, Dec 31 2010, 9:00p.m. - Sat, Jan 1 2011, 1:00a.m. L20, recently awarded the highly sought after 3-star rating in Chicago's first ever Michelin Guide, spells luxury from the moment you walk through the doors of the landmark Belden-Stratford Hotel into the dramatic two-story Grand Lobby where it is located. European ambiance oozes with the dazzling hand-painted sky motif ceiling, a grand piano and hand-woven tapestries before you even step inside L20. Once inside you can ring in the New Year in high style with either a seasonal 12-course tasting menu for $165 per person or the 10-course luxury menu for $245. Tuna, Hamachi, Yuzu, Chives Shimaaji, Miso, Pasilla, Lime, Breakfast Radish Moonfish, Avocado, Soy Diver Scallop, Passionfruit, Vanilla, Cauliflower Foie Gras, Citrus, Fennel Lobster Bisque, Chestnut Forest Mushrooms, Mushroom Bouillon Tai Snapper, Deconstructed Green Curry Halibut au Plat, Braised Leek, Lemon - Périgord Truffle Vinaigrette Korean Barbecue: Beef Tenderloin, Kimchi, Rapini, Lettuce Roasted Apple, Hazelnut, Brown Butter, Roquefort, Vanilla Orange, Grand Marnier. Seared and Cold Dover Sole, Watercress, Champagne Poulet Albufera White Truffle Mishima Ranch Wagyu Beef Exotic Fruit Consommé Chocolate. L20 is located at 2300 N. Lincoln Park West. Call Lynn Gefke-Reich for reservations at 773 866 0002. 3. 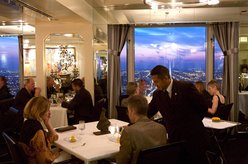 Celebrate in the Sky at The Signature Room. Option one: For $95 per person (including tax and gratuity) guests receive a festive dinner featuring three incredible courses for $95 per person. Seating reservations are available at 5 p.m., 5:30 p.m., and 6 p.m. Business casual attire is requested. 4. Pop for Fine Dining at Everest's Dom Perignon's NYE Party. Everest, among the most expensive and exclusive restaurants in Chicago, is offering a relative bargain for New Year's Eve. Guests can celebrate with a one-of-a-kind tasting menu to accompany Dom Pérignon's newest vintage and limited edition bottles, which pay tribute to the late artist Andy Warhol's famous pop-art silkscreens. The Dom Pérignon Andy Warhol Tasting Menu will be available for $125 per person plus champagne pairings. Everest's regular tasting menu will also be available on New Year's Eve for $125 plus wine pairings. Call Everest at 312 663 8920 for reservations and specifically request the Andy Warhol Tasting Menu. 440 S. LaSalle St. The Odyssey Fireworks Dinner Cruise includes passed hors d'oeuvres, a dinner of filet mignon and lobster, a premium open bar, a Chocolate Fountain, a champagne toast, live entertainment a spectacular view of the Navy Pier fireworks for $219.90 per person. Board 8:30p.m. ; Cruise 9:30p.m. to 12:30p.m. ; Dockside until 1:00a.m. Reservations at 866 305 2469.